Central Jakarta Secretary, Iqbal Akbarudin released 132 meat inspectors for Eid al-Adha. Personnel wer e separated in groups to visit 366 slaughtering locations in eight sub-districts.
" They will spread to slaughtering locations"
"They will spread to slaughtering locations to ensure those sacrificial animal's meat are eligible for consumption," he mentioned, Wednesday (8/22). Meanwhile, Central Jakarta Maritime Agriculture and Food Tenacity (KPKP) Sub-dept. 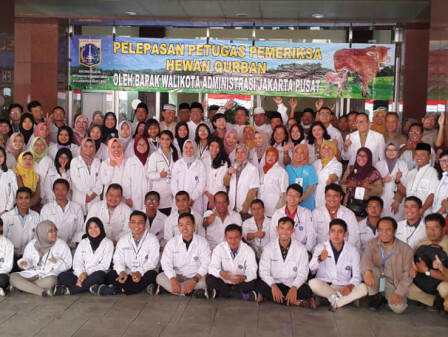 Head, Bayu Sari Hastuti explained, there are 44 people from IPB Veterinary Medicine Faculty, 7 people from Indonesian Veterinary Association, 48 Central Jakarta KPKP Sub-dept., 27 people from Jakarta KPKP Dept., and 6 people from Agriculture Ministry. "We are inspecting 366 locations in total eight sub-districts. Due to different quantity, we remind teams that already done in one location to help their comrades in other locations," she stated.